Not to be confused with Arthur Fielder. 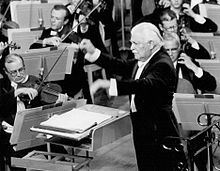 Arthur Fiedler (December 17, 1894 – July 10, 1979) was a long-time conductor of the Boston Pops Orchestra, a symphony orchestra that specializes in popular and light classical music. With a combination of musicianship and showmanship, he made the Boston Pops one of the best-known orchestras in the United States. Fiedler was sometimes criticized for over-popularizing music, particularly when adapting popular songs or edited portions of the classical repertoire, but he kept performances informal and sometimes self-mocking to attract a bigger audience. Fiedler was born in Boston, Massachusetts, the son of Johanna (Bernfeld) and Emanuel Fiedler. His parents were Austrian Jewish immigrants. His father was a violinist who played in the Boston Symphony Orchestra, and his mother was a pianist. He grew up in Boston, and attended Boston Latin School until his father retired in the early 1900s, and they moved to Vienna, Austria, in 1910. The family soon moved again, to Berlin, where from 1911 to 1915 young Fiedler studied violin at the Royal Academy of Music (Hochschule für Musik Berlin) under Willy Hess. Fiedler returned to Boston at the beginning of World War I. In 1915 he joined the Boston Symphony Orchestra under Karl Muck as a violinist. He also worked as a pianist, organist, and percussionist. Fiedler was appointed the eighteenth conductor of the Boston Pops Orchestra in 1930. While the position of conductor of the Boston Pops both prior to and after Fiedler tended to be a phase of a conductor's career, Fiedler made it his life's work, having the position for a half-century. With Fiedler's direction, the Boston Pops reportedly made more recordings than any other orchestra in the world, most of them for RCA Victor, with total sales exceeding $50 million. His recordings began in July 1935 at Boston's Symphony Hall with RCA Victor, including a world premiere recording of Jacob Gade's "Jalousie", which eventually sold more than a million copies, and the first complete recording of Rhapsody in Blue by George Gershwin (with Jesús María Sanromá as soloist; around that time they also made the first recording of Edward MacDowell's Second Concerto). In 1946, he conducted the Boston Pops in one of the first American recordings devoted to excerpts from a film score, Dmitri Tiomkin's music for the David O. Selznick Technicolor epic Duel in the Sun. RCA Victor released an album of ten-inch 78-rpm discs complete with photographs from the film. Fiedler's June 20, 1947, recording of Gaîté Parisienne by Jacques Offenbach was eventually released by RCA as their first long-playing classical album (RCA Victor LM-1001), in 1950. He recorded the same music in 1954 in stereo and began making regular stereo recordings in 1956. A number of Fiedler's recordings were released as 45-rpm "extended play" discs, beginning in 1949, such as Tchaikovsky's Marche Slave and Ketèlbey's In a Persian Market (RCA Victor ERA-2). Besides recording light classics, Fiedler also recorded music from Broadway shows and Hollywood film scores, as well as arrangements of popular music, especially the Beatles. He and the Boston Pops occasionally recorded classical works that were favorites, but not considered as "light" as most of the pieces that he conducted. He made but a single recording with the Boston Symphony Orchestra: Dvorak's New World Symphony. There were also recordings of chamber music by his Sinfonietta. Fiedler and the Boston Pops recorded exclusively for RCA Victor until 1970, when they switched to Deutsche Grammophon for classical releases with co-owned Polydor Records for his arrangements of pop music compositions and then London Records. His last album, devoted to disco, was titled Saturday Night Fiedler. Fiedler was also associated with the San Francisco Pops Orchestra for 26 summers (beginning during 1949), and conducted many other orchestras throughout the world. He was a featured conductor on several of NBC's The Standard Hour programs in 1950 and 1951, conducting the San Francisco Symphony in the War Memorial Opera House; the performances were preserved on transcription discs and later released on audio cassette. In very rare visiting performances, Fiedler accepted the invitation to conduct Don Caneva's John Hersey High School Bands after reviewing their latest recordings. Caneva said, “I was tremendously pleased and delighted when he said he would accept our invitation, after hearing a recent recording of the band." Fiedler ended up conducting twice for Caneva's bands in 1971 and 1972. In the final 1972 performance the band opened the Symphonic Winds portion of the concert with the "Festive Overture" by Dmitri Schostakovich, followed with the "American Salute" by Morton Gould. For the conclusion of this portion, Fiedler chose "The Finale From The New World Symphony" by Anton Dvorak. He also conducted Leroy Anderson's "Serenata" with the high school band. Fiedler dressed for the part of a fireman for a show skit. Red Skelton is dressed as Clem Kadiddlehopper. Fiedler had many different hobbies. He was fascinated by the work of firefighters and would travel in his own vehicle to large fires in and around Boston at any time of the day or night to watch the firefighters at work. He was even made an "Honorary Captain" in the Boston Fire Department. A number of other fire departments gave him honorary fire helmets and/or badges. The official biography of Fiedler reports that the conductor once helped in the rescue efforts at the tragic Cocoanut Grove fire in Boston in 1942. An avid sailor, he volunteered during the early days of World War II for the Temporary Reserve of the U.S. Coast Guard and was later a member of the Coast Guard Auxiliary. Fiedler conducted at the nationally televised opening ceremonies of Walt Disney World in 1971. He also appeared on numerous telecasts on Evening at Pops, carried on PBS stations nationwide. In 1972, Fiedler was awarded an Honorary Doctorate of Music from Berklee College of Music. Fiedler is best remembered by contemporary audiences for his conducting of the Boston Pops at the outdoor Hatch Memorial Shell on the July 4, 1976 celebration of the US Bicentennial. The rendition of the 1812 Overture led by a jacketless and demonstrative Fiedler, capped by a huge fireworks finale over the Charles River was the climax of all day long network television coverage. The video of the aged but obviously delighted Fiedler puffing out his cheeks to the beat of the music and mugging for his musicians was one of the most talked about images of the country's celebration. In honor of Fiedler's influence on American music, on October 23, 1976 he was awarded the prestigious University of Pennsylvania Glee Club Award of Merit. Beginning in 1964, this award "established to bring a declaration of appreciation to an individual each year that has made a significant contribution to the world of music and helped to create a climate in which our talents may find valid expression." Mr. and Mrs. Arthur Fiedler and Wernher von Braun in his office during the Fiedlers' visit to the Marshall Space Flight Center on March 23, 1962. In 1942, Fiedler married Ellen Bottomley, and they had three children: Johanna, Deborah, and Peter. 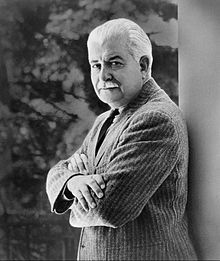 In 1994, Doubleday published a book written by his daughter, Johanna, titled Arthur Fiedler: Papa, the Pops and Me. Fiedler died on July 10, 1979 after having been in failing health for some time. During the previous winter, he suffered a stroke that temporarily left him unable to speak, but he quickly recovered and in May conducted a concert to celebrate his 50th anniversary as conductor of the Pops. A few days later, he had a mild heart attack after another performance. He collapsed while studying music scores in his Brookline, Massachusetts home and suffered cardiac arrest. After his death, Boston honored him with a stylized sculpture, an oversized bust of Fiedler, near the Charles River Esplanade, and named a footbridge over Storrow Drive after him. This area is home of the free concert series that continues through the present day. Composer John Williams succeeded Fiedler as the orchestra's nineteenth director. His widow, Ellen Bottomley Fiedler, died October 25, 1984, in Framingham, Massachusetts. She was 70. ^ a b c d e Hughes, Allen (July 11, 1979). "Arthur Fiedler, 84, Conductor of Boston Pops 50 Years, Dies". The New York Times. Archived from the original on 24 October 2010. Retrieved October 26, 2010. ^ Murrells, Joseph (1978). The Book of Golden Discs (2nd ed.). London: Barrie and Jenkins Ltd. p. 21. ISBN 0-214-20512-6. ^ Jeremy Nicholas. "Booklet notes to Hyperion CDA67165". Hyperion-records.co.uk. Retrieved 27 October 2017. ^ Edgers, Geoff (May 2, 2007). "Saturday Night Fiedler". The Boston Globe. ^ "The Daily Herald from Chicago, Illinois · Page 29". Newspapers.com. 1970-12-14. Retrieved 2015-08-27. ^ "Frequently Asked Questions". U.S. Coast Guard Historian's Office. Retrieved 2017-12-05. ^ "Honorary Degree Recipients". Berklee College of Music. Retrieved 2017-12-05. ^ "Boston Pops 1812 July 4, 1976 Bicentennial". YouTube. 25 May 2013. Retrieved 27 October 2017. ^ "The University of Pennsylvania Glee Club Award of Merit Recipients". Dolphin.upenn.edu. Archived from the original on 2012-02-09. Retrieved 2015-08-27. ^ "Non-fiction review: Arthur Fiedler: Papa, the Pops and Me". Publishers Weekly. August 29, 1994. Retrieved April 16, 2011. "Remarks Upon Presenting the Presidential Medal of Freedom". The American Presidency Project. Dickson, Harry Ellis (1981). Arthur Fiedler and the Boston Pops. Boston: Houghton Mifflin. ISBN 0-395-30524-1. Fiedler, Johanna (1994). Arthur Fiedler: Papa, the Pops and Me. New York: Doubleday. ISBN 0-385-42391-8. Moore, Robin (1980). Fiedler, the Colorful Mr. Pops: The Man and His Music. Cambridge, MA: Da Capo Press. ISBN 0-306-76008-8. Wilson, Carol Green (1968). Arthur Fiedler: Music for the Millions. New York: Evans. Wikimedia Commons has media related to Arthur Fiedler.